Not to be confused with SOS Fantômes, the 1984 film starring Bill Murray and Dan Aykroyd (and remade in 2016), stations fantômes are the 16 Parisian metro stations which were never completed, were opened only to be closed some years later, or were just plain abandoned before ever being used by a single passenger! If you read in French, you can find out more about all of Paris’ ghost metro stations on a web site that explores Paris’ insolite (strange) and secret side, Paris ZigZag. But the ghost station that interests me here is Martin Nadaud, opened in 1905 and "reabsorbed" into Gambetta’s station in 1969. What happened? The original Line 3 ended at Porte des Lilas. But in 1969, it was rerouted towards Porte de Bagnolet instead, and an extra "mini-line" was created, from Gambetta to Porte des Lilas (called Line 3bis, or 3b). Incidentally, if you’ve ever seen the Paris metro featured in films like Julie and Julia, the station you’ll see is Porte des Lilas, the only one equipped to accommodate film crews! But back to Gambetta: during the reorganization of Line 3, the Martin Nadaud station got swallowed, which explains why the platform (or quai) at Gambetta is so long on one end. But if you take the time to walk further, and get out at Place Martin Nadaud, a lovely little slice of the 20th awaits you! First of all, the metro exit here is on the Historic Monuments register, since it’s the classic design by Hector Guimard – all whiplash lines and Art Nouveau "noodles" (people who made fun of Art Nouveau in the day called it le style nouille). The plaza itself is a bit of a mish-mash of styles, but is surrounded by the Père Lachaise cemetery wall on one side, and a line-up of welcoming cafés on the other. They’re made even more welcoming since the road along the plaza was closed to traffic: before, cars whizzed by just in front of the cafés – plutôt désagréable, as the French would say. Now, in between the metro entrance and the cafés, the portion of closed-off road is more agreeable, and decorated by playful rainbow stripes, designed by artists Sabina Lang and Daniel Baumann (known simply as L/B). Their visual trademarks – because most artists have one or two (think Daniel Buren’s stripes in the Palais Royal’s gardens in Paris) – are stairs that lead nowhere, outgrowths bubbling from buildings, and their ubiquitous Street Paintings. What about the establishments around the plaza? You can bet I’ve tested them: for a glass of wine, try Les Foudres at one end (where you won’t get struck by a lightning bolt, a foudre, but you might catch the last ray of sun if you position yourself strategically at the very end of the plaza – the sun sets behind the beautiful little hill made by the rue Gasnier Guy). For a bite to eat, head over to Café Martin, where Chef Nicolas Fromain turns out basic but "cared-for" (soigné) bistrot bites. He has both an à la carte menu, geared towards what chefs here call produits travaillés – the kind of unusual or high-end ingredients you won’t probably make at home, like foie gras. One question remains: who was Martin Nadaud, for whom the plaza was named? 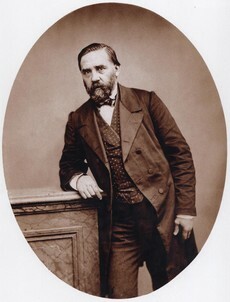 Born in 1815, Nadaud was a stonemason and, like Léon Gambetta, for whom the "new" metro station is named, a politician. His claim to fame is an expression we use often in French: "Quand le bâtiment va, tout va" or "when the construction industry is going well, the economy is going well." Recently the mairie, or town hall of the 20th district, voted (after a locals-only referendum) for the renovation of Martin Nadaud plaza. So like Chef Nicolas’ products, the plaza will soon be sublimed and refined, giving even more weight to Nadaud’s famous phrase. Another noteworthy thing to see around the plaza is the gorgeous day-care center, or crèche, at the western end of the plaza. It was built in 1899 and is still used with its original purpose in mind: to care for children while their parents work, in a "house" that looks straight out of a fairy tale! Fresh fava beans from the market (also known as broad beans) are a glory of nature and taste heavenly – but they’re hell to prepare! After removing the beans from their pods, each bean must be individually peeled. Ask anyone who’s done this – it takes an inordinate amount of time. We do it at home only when we want to toss a few fresh fava beans into a salade niçoise. Otherwise, we walk up to our local Picard store, which sells high quality frozen foods here in France, and we pick up a bag of frozen, peeled, and blanched fava beans. In the U.S., Goya brand frozen fava beans are available at stores like Wegman’s and many other stores (click here and scroll down for a list). Chef Nicolas’ confit of fava beans is wonderful: he soaks the fava beans in a liter of olive oil before they get emulsified into an ambrosial and surprisingly light chilled soup. But for the home cook, a confit is too wasteful! In professional kitchens, we can recycle a whole liter of olive oil into a sauce or other preparation. In my version of Chef Nicolas’ recipe, we simply add a bit of olive oil to the chilled soup, infusing the oil taste without all the fuss of having to reuse the olive oil. 1. If you’re using fresh fava beans, blanch and peel them. 2. Now blanch the peeled fava beans (fresh or defrosted): bring a large pot of water to the boil: I used about 1 gallon (4 liters) of water and 2 tablespoons of coarse salt. 3. Add the bay leaf and rosemary, and then add the fava beans and bring back to the boil over high heat. Cook them for 4-5 minutes. Immediately drain and then pour the fava beans into an ice bath, transferring to the colander just as soon as they’re cool. Drain well. Remove the bay leaf and rosemary. 4. Chop the chorizo. Heat the teaspoon of olive oil in a small saucepan over medium-low heat and add the chorizo. Sauté slowly for 5 minutes. 5. Add the cream and bring to the boil over medium-high heat. Lower the heat and simmer for 8-10 minutes to reduce the cream: it should become quite thick. Strain the cream through a chinois or a fine-mesh strainer, pressing on the chorizo to extract as much cream as possible. Cool and then refrigerate this cream. 6. Quickly run the leftover chorizo under running water and let drain well. Taste a piece of chorizo: depending on the quality used, you may refrigerate these "used" chorizo cubes for a garnish, but if the chorizo has given up all its flavor to the cream, don’t worry about tossing it. 7. Transfer the cooled fava beans to a food processor. Process with the tablespoon of olive oil to make a thick paste and add ½ to 1 cup water (or vegetable stock if you didn’t use bay leaf and rosemary during the cooking stage) to thin the soup slightly. 8. Chill the soup for at least 2 hours. 9. When you’re ready to serve the soup, chop the herbs finely, mix them together, and divide into 7 or 8 tiny piles on your cutting board. 10. Divide the soup among 6 soup plates (photo) or tiny bowls if serving as a pre-appetizer. Add a pinch of Guérande sea salt, and a dollop of chorizo cream. Sprinkle with the chopped herbs and finish with a bit of Guérande sea salt and a twist of the pepper mill. Serve right away, passing around any extra chorizo cream at the table. Merci Allison pour toutes ces délicieuses recettes !